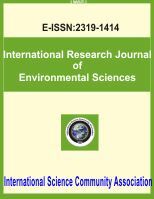 International Science Community Association are publishing an international peer reviewed journal International Research Journal of Environmental Sciences. It is the vision of International Science Community Association to publish research papers, research articles, review papers, mini review, case study and short commutations in all areas of human study without financial restriction. Coverage Area: Researches in the field of environmental science such as Aquatic Sciences, Energy Resources and Conservation, Environmental Chemistry, Environmental Biology, Environmental Economics, Environmental Engineering, Environmental Physics, Environmental Health - Public Health, Environmental Law - Policy - Eco Justice, Environmental Management, Environmental Toxicology, Global Change, Climate Change, Monitoring, Environmental Analysis - Monitoring, Nature Conservation - Biodiversity, Pollution and Remediation, Soil Science, Sustainable Development.